Home » Blog » What’s the Difference Between Chain Drive vs Belt Drive? The chain drive and belt drive opener configurations offer similar utility but have varied characteristics to consider while making your purchase decision. Here’s what to expect regarding construction, durability, noise, and speed for chain drive versus belt drive openers. Chain drive garage door openers operate using a basic roller chain and pulley system. Once the opener receives the signal from your remote, the chain drive system pulls the door up and down along the overhead tracks. The belt drive system works in a similar way, except the chain mechanism is replaced with a strong belt made from rubber or polyurethane. For extremely heavy doors, the belt may have steel reinforcements interwoven into the principal material. When kept in optimal condition, chain drive openers seldom fail outright. Since the chain and pulleys are metal to metal, adequate lubrication, proper alignment, and optimal tension rates are vital. Otherwise, the pulley may start to eat away at the chain, causing a dusting of metal powder to rain down from above. Due to the malleable nature of rubber and polyurethane, belts drive systems are also extremely sensitive to alignment, tension and lubrication discrepancies. When maintained on a regular schedule, however, belt drive systems will remain operational just as long as chain drive openers. Since both the chain and pulleys are made from pure metal materials, the chain drive openers are often fairly noisy. As the door opens and closes, the metals tend to clank together rhythmically the entire way. When in good condition, belt drive systems are basically whisper quiet while in operation. Both systems can become noisy without timely maintenance, however. Your garage door maintenance professionals must regularly clean and oil the tracks and pulleys to keep the system from squealing or grinding. For safety reasons, both types of garage door openers raise and lower at a slow, steady rate. The speed of belt drive systems is a bit more consistent than chain drive due to the smooth operation of the belt and pulley. The slow speed allows the safety system to detect obstructions and reverse the door operation promptly. 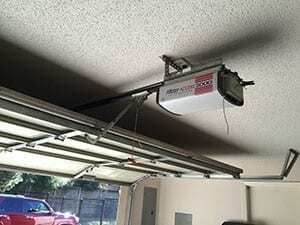 If you cannot come to a decision after weighing the chain drive vs. belt drive differences, read more information on garage door drives here or contact the team at Action Garage Door Repair Specialists for professional assistance. Your garage door experts will help you identify, purchase and install the best garage door opener for your home and expectations. You can also schedule your garage door maintenance and repair services at that time if needed.